Stranger Things returns to Netflix this fall with new episodes. The streaming service has released a trailer for the second season of its hit series at San Diego Comic-Con, featuring Michael Jackson’s 1983 single “Thriller”. 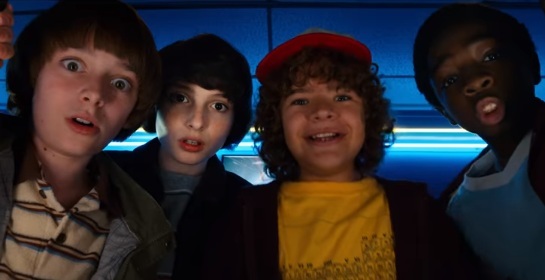 Millie Bobby Brown is confirmed to be reprising her role as the sweet but terrifying telekinetic wonder Eleven, Winona Ryder is returning as frazzled Joyce Byers, Cara Buono as Karen Wheeler and David Harbour as Jim Hopper, Finn Wolfhard, Caleb McLaughlin and Gaten Matarazzo reprise their roles as Mike, Lucas and the inimitable Dustin. There will be also cast additions: Sadie Sink, who will portray a tough 13-year-old girl named Max, Dacre Montgomery, who will play Max’s stepbrother Billy, and Linnea Berthelsen, who will play the mysterious Roman, Will Chase, who will play Neil Mayfield, the father of a new family from California who move to Hawkins, Indiana, Brett Gelman, Sean Astin, and other. The upcoming season of the show created by Matt and Ross Duffer, which will consist of nine episodes, is set in late 1984, a year after the events of the first season, and will venture outside of Hawkins, Indiana. Will Byers seems to be seeing images from the strange netherworld Upside Down, which Police chief Jim Hopper is desperately trying to keep secret from the community to protect the Byers family. Stranger Things season 2 is set to launch on Friday, October 27, 2017.